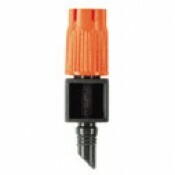 Gardena range of micro drip irrigation equipment for use in the garden. The Gardena micro drip irrigation system is a versatile system that can be mixed and matched to suit your watering needs. The system can be used on the balcony, patios, vegetable areas and in beds and borders. 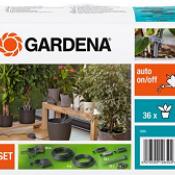 The Gardena Micro Drip Irrigation system uses 'Quick & Easy' pipe connection technology which makes the process of setting up and modifying the system a lot simpler. The Gardena Micro Drip Systems promote plant growth and reduce water consumption. This efficient type of watering system supplies water directly to the root system exactly where it is needed avoiding over watering and evaporation of precious water supplies. For DIY installations we would be pleased to offer telephone assistance for any products purchased from our website. Please view the informational video for further details.